The Illinois Lease Termination Letter Form may be used to satisfy the Illinois State requirement of submitting a thirty notice when terminating a month to month rental agreement. Such a rental agreement comes with quite a few benefits however one of the disadvantages of a month to month is the potential for a sudden departure of an income source for a landlord or the loss of a home for a tenant depending on who wishes to terminate the agreement. This can prove to be quite a problem, however; the State of Illinois’ thirty-day notice requirement solves this dilemma nicely. 735 ILCS 5/9-207 – Landlord and tenant are be required to provide each other at least thirty (30) days’ notice before canceling a tenancy at will. Users of this form should be aware that it may be utilized by and for both parties when being issued. Thus, read the form and the directions carefully. Also, it is important to make sure the party receiving the notice does so thirty full days before the date of termination. This means, such a document cannot be mailed thirty days before but rather if mailed must be done to allow the post office (or similar service) to deliver it. The recipient must be in possession of this thirty full days’ ahead of time and should be mailed in a way that is provable (i.e. certified or registered mail). If the lease calls for such a notice to be posted somewhere then it may be wise to have a reliable witness at the time of posting. This is a wise precaution in cases where the landlord/tenant relationship may be considered tenuous but is generally recommended in all cases as well. 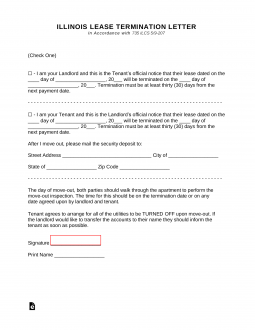 Step 1 – The first step will be to note whether you are a landlord or tenant. If you are the landlord, check the first box then the day, month, and year of the lease. Then enter the day, month, and year of the termination date. Step 1 – It is important to indicate whether you are the landlord or tenant. Check the second box to indicate you are the tenant. Then enter the lease date and the desired termination date. Step 2 – It is imperative to enter the street address, city, state, and zip code where you may receive your security deposit.